If you are knew to the world of Porsche and haven’t been keeping up with the Porsche changes the Porsche Caymen S is basically a Boxter with a hatchback and a steel coupe roof. But wait there’s a little more to it. The Cayman has a stiffer set of springs for the strut suspension, thicker anti-roll bars, and it comes standard with 18 inch wheels. 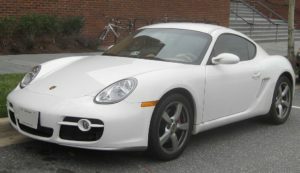 The Caymen uses the familiar 3.4 liter engine seen in the Porsche M96, Boxter, and 911. Of course it’s been tweaked and now it delivers a whopping 295 HP and 255 pound foot of torque. 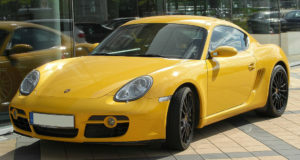 The old Boxter version had only 280 HP and 236 lb-ft to offer. From 0 to 60 is capable in 5.1 seconds you’ll find your top speed at 171 MPH. That’s all the speed you’ll ever need. The PSM or Porsche Stability Management System is standard equipment on the Caymen. And the Sport Chrono package with built in lap time counter will be optional. Another option is ceramic brakes. If you aren’t familiar with ceramic brakes you should be. These brakes are half the weight of stand cast iron brakes. You get exceptional braking power, less heat fade, and low brake dust. They Cayman brakes are identical to the Boxter’s with just a little more air cooling and ABS tweaking. A look at the exterior and you will instantly know that the body is built off the Boxter platform. In fact many of the body panels are interchangeable. The rear windows are the same shape as the 911 if you were to turn them on end. The Cayman has a rapidly sloping hatch that drops quickly and deeply and it is accented with a scripted Cayman S on the rear wing which deploys at speeds over 75 MPH.The hatch is a nice light weight which rises with no effort presenting you with a nice size trunk that is a decent depth. It’s very similar to the Boxter trunk.And there was some smart design thinking here. An aluminum scuff plate covers the area from trunk up to the cargo shelf. There are also two narrow storage bins and there is plenty of useable floor space. If you are familiar with the Boxter when you park yourself in the driver’s seat you’ll instantly feel like your back in the Boxter except that the instrument faces are gray and the cargo shelf is behind your head. So are you ready to take it for a cruise? First thing you’ll notice is that the Caymen fits both driver and passenger snuggly. You’ll notice the night tight suspension and how the car hugs the road never missing a beat. It’s impressively intuitive as long as you don’t mess up. The steering puts you in complete control with the blacktop and its responsible and sensitive to your every mood. Drive it neatly and it will never let you down. 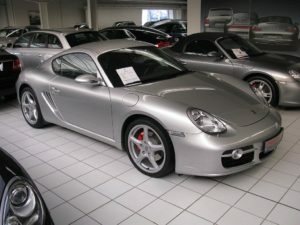 Know your car and how to drive and it will be hard to be outperformed.First impressions are that the Cayman is as snug-fitting for the driver as it was for the passenger and that the mid-mounted engine makes life hard for the air-conditioning; the cabin serves up rump roast over frozen heart as a summer dish. The chassis has been seriously beefed up and is more of a partner than ever before. Combine that with the Michelin tires that have amazing gripping you are going to have a ride like nothing you’ve experienced before. The new Caymen is everything the 911 has always been and more. It’s not only a great ride on the street it’s also a great track ride. It sounds great, looks great, and performs great. But then after all it’s a Porsche and would you accept anything less? If there were awards for best car this one would certainly be in the running. If you haven’t checked out the Porsche Caymen be sure you do!